Schoolhouse Ronk: What do you think of this lamp? Updated 5-13 @ 12:30: Nevermind, Brian saw the picture and he isn't a fan. So I guess I will be ordering from PB Kids soon for the other lamp. It is posted on cherrypointyardsales for $25. 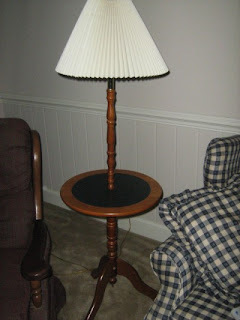 I would paint it maybe with a high gloss light green like the color of the other lamp and I would switch out the shade. I am just thinking it might be nice to go next to the rocking chair (which might turn out to be a la-z-boy we also found on CPYS). What do you think? It probably reminds him of one I had in the Sunnyside house when he was young. We inherited from Fred's dad.